Snarky Marcie: How to strengthen an argument. Don't fling your opinions at me, or my Facebook wall. It's another day and another issue is flooding my social media. Ever feel the need to lose faith in society and the intelligence of the human race? Spend 5 minutes reading the comments under any popular news article. More than once, I've been lost and dragged under by a comments section. It's like watching a train wreck turn lynching mob. My usual takeaway is how can people be this stupid. What gets me the most is that it's a known pit of stupidity, but intelligent people still succumb. Are you gluttons for punishment? You really think the way to convince me of your beliefs is to shout at me on social media? Just stop. You're making a fool of yourself, and making your friends question their association. 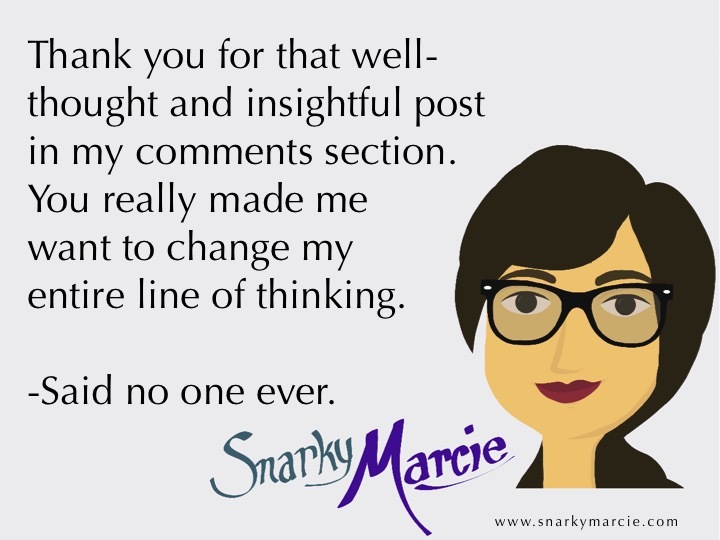 If you're looking for a soap box and the opportunity to share your opinion with little to no response, write a blog. But, don't post it on social media where your friends are forced to see it and question your sanity and relationship. 4. Appeal to my logic. I try, pretty hard to be logical. Granted, I realize that no one admits to thinking illogical. That would be silly. If you know you're illogical, you'd change your thinking. Anyways, logic means a lot to me. Sure, I'm a Christ-follower and you may argue that it isn't logical, but we can chat about that offline...not in this blog's comment section. Logic, our brains, common sense, these are the tools at our disposal. Stick to the facts, and keep your ungrounded opinions out of it. Thanks, Al. I agree, imagination is a great deal of awesomeness...but not when you're trying to argue with me. If you use your imagination in the argument, I'll see your crazy and raise you an unfriended. Yes, yes...I'm all about the snarky comments, but there is a time and a place. Remember, this is my blog and I get to say what I want (hopefully what you find logical) and I won't force you to read it. Sure, I may share an eCard here or there and get super excited when you share my content, but I won't berate you on social media. Because social media is an opportunity to be social...not a communication channel for your rantings on everything under the sun. Don't insult me. Chances are we won't be arguing online, because I'm no into that...duh. But, if you find yourself disagreeing with me and failing to find a concrete rebuttal, don't resort to insults. Sure, you don't like my shirt, hair, smile, or skin tone...that's your choice. Don't share your petty insults with me. I'm not looking for your approval. If you really, truly need to convince me to agree with you, you need to have my trust. Trust is earned, you know that. So do it, earn it. If you're shouting your alternative opinions at me and I don't even have a level of trust developed with you, just shut up. If I don't trust you, just think of me as a brick wall. Okay, so the most important 'tool' doesn't actually let you win the argument, but it may be an attempt at playing the long game. The truth is, if I want your opinion...I will ask for it. If I didn't ask for it...you know what to do, or what not to do. Don't run off now, I know you missed the last post...or at least the post before that.